Celebrating day seven of the twelve days of C-3PO and R2-D2 covers! 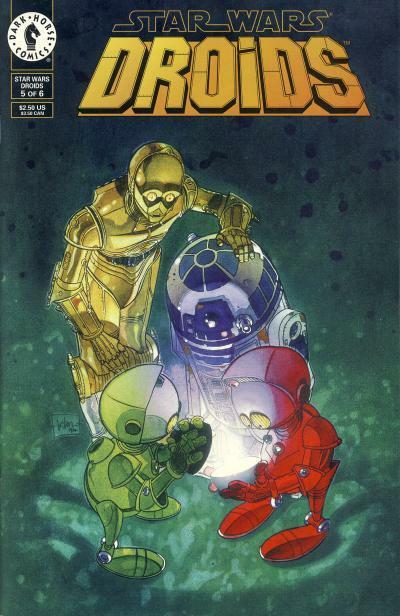 After Droids debutted in the Dark Horse Comics title, a 6-part mini-series was released. These stories are before the events in the original trilogy and are dubbed The Kalarba Adventures since they take place in the Kalarba system, although this is a later designation not used when the individual issues were being released. Each issue in the mini-series has a standalone story, although there are some characters that appear in many of them. The preview 3-part story in Dark Horse Comics introduces Oleg Greck, the main antagonist of the mini-series, and Jace Forno, another grey character that reappears in the mini-series. Other characters introduced in the preview that appear throughout the mini-series are Baron Pitareeze and his grandson Nak. C-3PO and R2-D2 serve as Nak's guardians. "Actually, there's not much to tell." These stories would fit right in with the Droids cartoon or Marvel's original Droids title. Dark Horse was definitely experimenting with the Star Wars titles trying to find out what would sell. The only original stories Dark Horse had released was Dark Empire and Tales of the Jedi; the rest of the comics were Classic Star Wars titles. 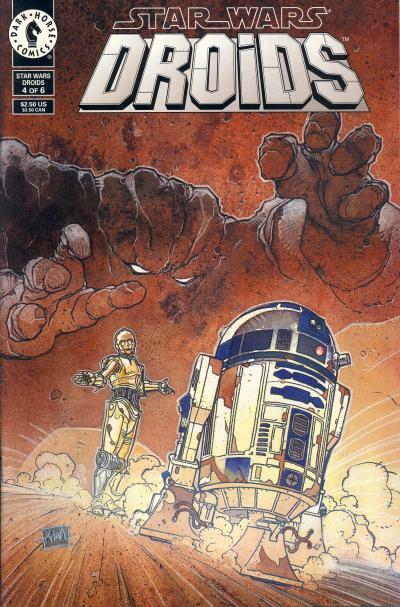 Cam Kennedy, artist for the Dark Empire and Dark Empire II mini-series, provides the cover art for Droids #1. 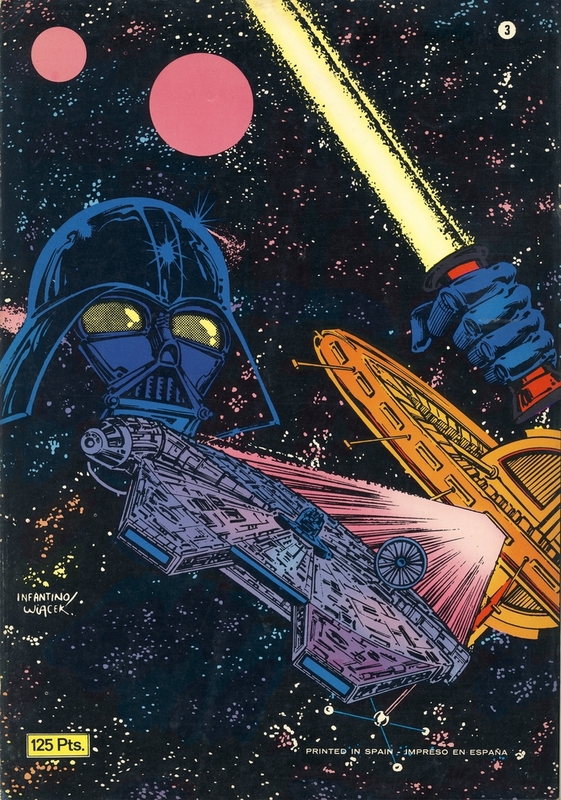 It is one of the few gimmick covers Dark Horse did for the Star Wars line. It is a embossed cover with an all black background, which really contrasts with the colors of C-3PO and R2-D2. 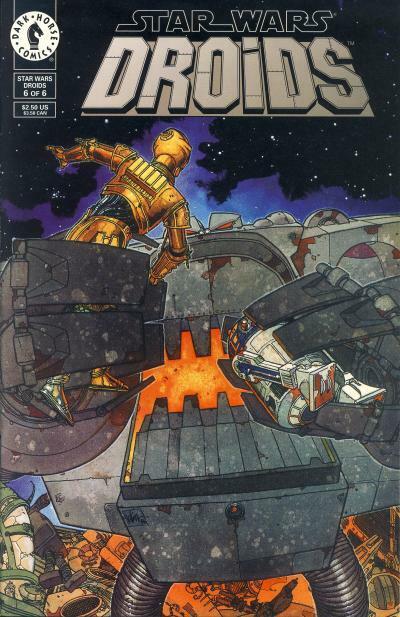 Kilian Plunkett provides the cover art starting with Droids #2. It is mostly a serious take on otherwise silly, slapstick stories. He would provide the cover art for the rest of this mini-series and all 8 issues of the subsequent series. The armed protocol droid on the cover is C-3PX. Looking very much like C-3PO except for an X on his face plate, C-3PX was reprogrammed by Olag Greck as an assassin droid, complete with all manners of retractable assassination tools. C-3PX has a surly disposition and is a prototype for 0-0-0 or Triple-Zero that appears in Marvel's current Star Wars line. This character is used beyond this comic. The mini-series ends with C-3PO and R2-D2 accompanying the droid Unit Zed, head of automated security on Hask station, in pursuit of Oleg Greck heading to the Corellian sector. Celebrating day six of the twelve days of C-3PO and R2-D2 covers! 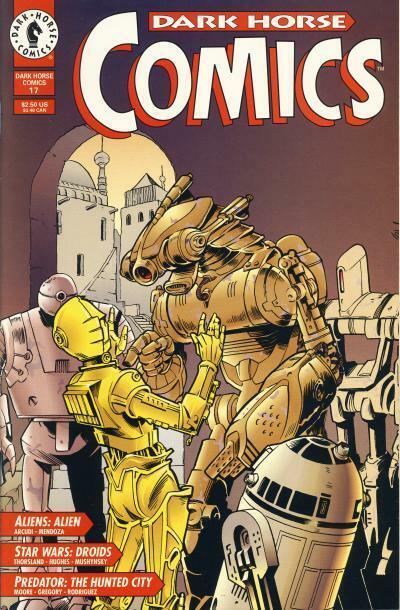 Dark Horse's Droids began in a 3-part story in the anthology title Dark Horse Comics. They used the same approach with the Tales of the Jedi a year earlier. 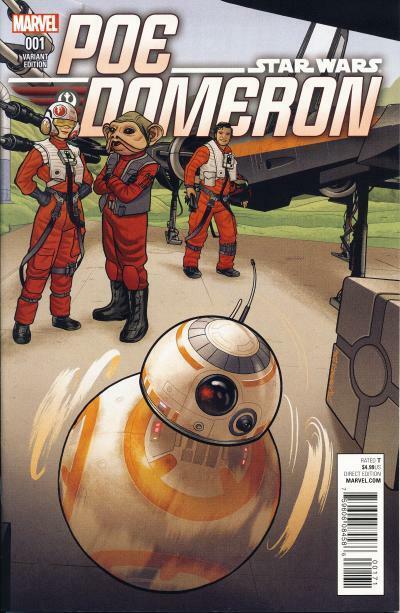 Only issue #17, the first part of the story, has a Star Wars cover. 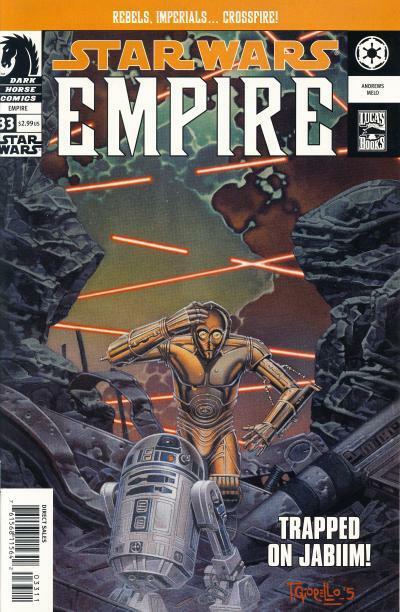 The cover shows C-3PO and R2-D2 facing off against some tough looking droids. The scene on the cover never actually appears in the story and the art is provided by Bill Hughes who also does the interior art. The tales does feature the bounty hunter IG-88 and his absence on the cover seems like a lost opportunity. All 3 parts are collected in the one-shot Droids Special. The cover is provided by Kilian Plunkett who provides the bulk of the cover art for Dark Horse's Droids offerings. 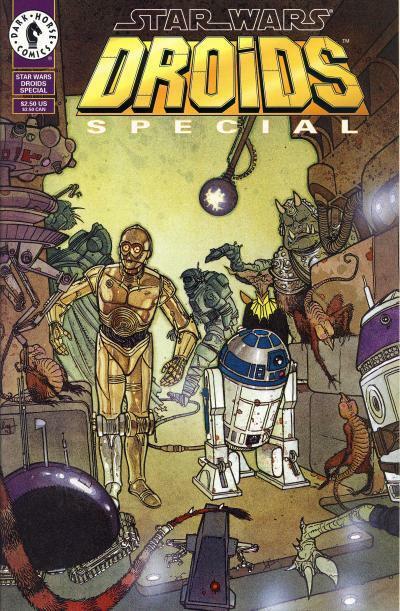 This cover shows C-3PO and R2-D2 surrounded by an assortment of otherworldly creatures and robots. Recognizable are an Imperial Probe Droid, a Gamorrean Guard, and, in the foreground, a LIN droid. Kilian Plunkett's covers use muted colors and everything looks dirty. This fits very much with George Lucas' vision of a used universe. The covers tend to be serious, which is not reminiscent of the tales inside. Unfortunately, Dark Horse went with a semi-humorous, cartoonish approach for most of the Droids stories not unlike Marvel's Droids title. I tend to think this is why Tales of the Jedi had 7 highly regarded mini-series while Droids had only 2 mostly forgettable mini-series. Celebrating day five of the twelve days of C-3PO and R2-D2 covers! Star Wars' "used universe" aesthetics is an important part of its appeal. Instead of a sterile science fiction setting like many of its predecessors, the Star Wars film show a galaxy that is lived in. Spaceships are dirty and banged up. Denizens wear worn clothes or even rags. Locations are grimy and gritty. The "used universe" extends beyond the textures of what we see however; it is also accompanied with a rich history woven into its fabric. From the beginning, the Star Wars universe has a past that helps explain the present. Obi-Wan Kenobi tells Luke Skywalker about the Old Republic that fell to the Galactic Empire in the Clone Wars. There is a history of conflict between the settlements on Tatooine and the nomadic Tusken Raiders. The Rebel base occupies the abandoned Massassi Temples on Yavin 4, temples built thousands of years before. This mixing of the past and present is even seen on screen in the recent movies The Force Awakens and Rogue One. Luke is on the water world Ahch-To seeking answers in a early Jedi Temple. In Rogue One, Saw Gerrera operates out of hidden base on the holy planet Jedha hidden beneath ancient ruins. Most planets are not pristine and newly discovered but instead had thriving civilizations that either died out or were abandoned. New civilizations moved in and this cycle has probably happened multiple times. 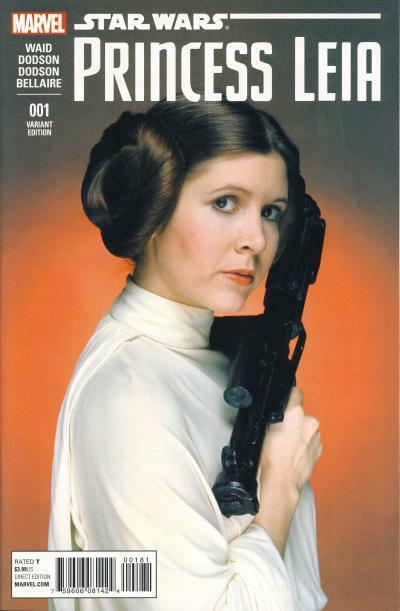 This rich history is used to good effect in The Darker in Star Wars #67. R2-D2 wanders off into an unexplored tunnel at the Rebel base on Arbra. (This is reminiscent of the cut scenes on Hoth where the Rebel base is attacked by Wampas.) A Hoojib, a native species of Arbra, witnesses R2-D2 wandering off and reports to Plif who tells C-3PO his concerns. C-3PO enlists the aid of Chewbacca and together with the Hoojibs they set off to find R2-D2. What they find is an abandoned ancient city and a trapped, malevolent manifestation of the previous inhabitants' dark energies, The Darker. In the end, the unlikely pair rescues R2-D2 and kill The Darker. The cover by Tom Palmer shows C-3PO, R2-D2, and Chewbacca with The Darker sneaking up behind them. Palmer is joined for the first time on the interior by penciller Ron Frenz. Celebrating day four of the twelve days of C-3PO and R2-D2 covers! Star Wars: Empire #33 is the penultimate chapter in the 5-part In the Shadows of Their Fathers story. In the story, Princess Leia offers the Jabiim Loyalist assistance by the Rebel Alliance against the Jabiim Nationalist allied with the Empire, but Luke Skywalker's presence is unexpected and unwelcome. Years earlier during the Clone Wars, Anakin Skywalker is on Jabiim fighting alongside the Loyalist against the Nationalist, then backed by the Separatists, but he is forced to withdraw the Republic assistance. The Battle of Jabiim is told in Star Wars: Republic #55 - 58. The Jabiim never forgave Anakin for this act of betrayal and the Rebels are detained while the Loyalist determine what to do with them. Before a decision is made, the Empire launches a full scale assault on Loyalist bases and the Rebels are compelled to leave, but not before Luke Skywalker redeems the Skywalker name. While C-3PO and R2-D2 have a negligible role in the story, their plight against Imperial Stormtroopers is captured on the cover. To help Princess Leia, Luke Skywalker, Nera Dantels, and Jorin Sol, the droids leave Dantels' ship, the Starduster, but are attacked by a squad of Imperial Stormtroopers including an AT-ST. Leia and Dantels end up rescuing the droids. Their presence in the story is to show the dire situation the Rebels are in when the Empire attacks. Celebrating day three of the twelve days of C-3PO and R2-D2 covers! Star Wars action figures are the quintessential Star Wars product. The comics are important, but the toys are how many fans connect with the movies. When Star Wars went away in the 1980s, the comics and books led the return in the early 1990s. But it was Hasbro's release of new action figures in 1995 (Hasbro acquired Kenner in 1991) that really kicked the Star Wars revival into full gear. Since then, Star Wars toys have become a perennial of toy aisles and is one of the strongest selling toy lines year after year. It makes sense that Marvel would want to capitalize on the nostalgia fans have for the vintage action figures by publishing a series of original covers that look like Star Wars action figures in their original packaging. Every issue of the main Star Wars title has an action figure variant cover as well as several issues of the other titles. The first twelve action figures released by Kenner were: Luke Skywalker, Princess Leia, Han Solo, Chewbacca, C-3PO, R2-D2, Obi-Wan Kenobi, Darth Vader, Stormtrooper, Death Squad Commander, Jawa, and Sand People. The first ten Star Wars issues along with Princess Leia #1 and Darth Vader #1 include all twelve of these characters. All of the action figure variant cover art to date are drawn by John Tyler Christopher. C-3PO and R2-D2 are the subjects of the action figure variant covers for Star Wars #5 and 6. The original twelve characters are joined by Lando Calrissian and Boba Fett to make up the characters on the Vader Down shared retailer exclusive. The character art for this cover is the same art from the previous action figure variant covers. Six retailers participated in this promotion: Midtown Comics, Forbidden Planet, All Heroes Comics, Buy Me Toys, Wanted Comix, and Wonderworld Comics. Each has the same art but use the specific store logo on the cover. 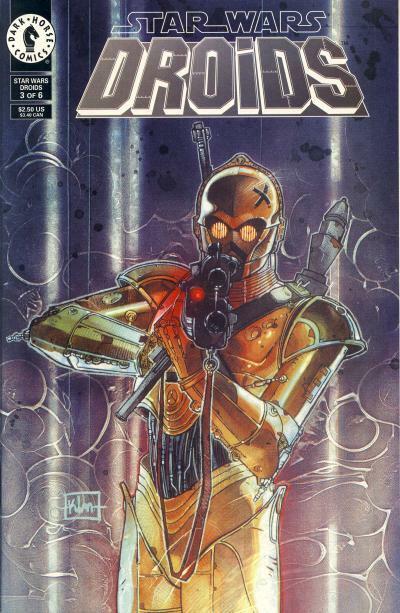 Star Wars Special: C-3PO #1 was meant to be released closer to the debut of The Force Awakens in theaters. 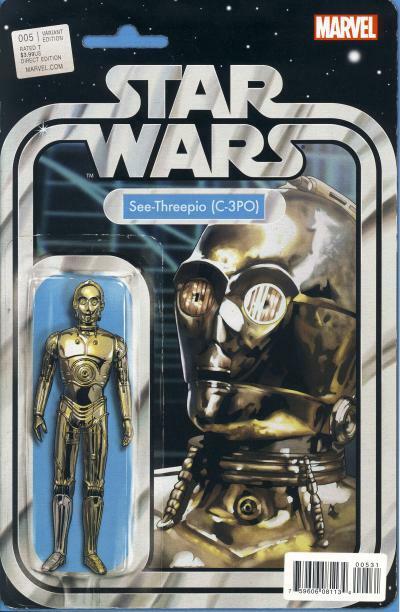 It was delayed however and released in April 2016 with a C-3PO action figure variant representing the droid in that movie. The action figure art is identical to the art on Star Wars #5, except the right leg is gold and the left arm is red. The "cardback" art is different. 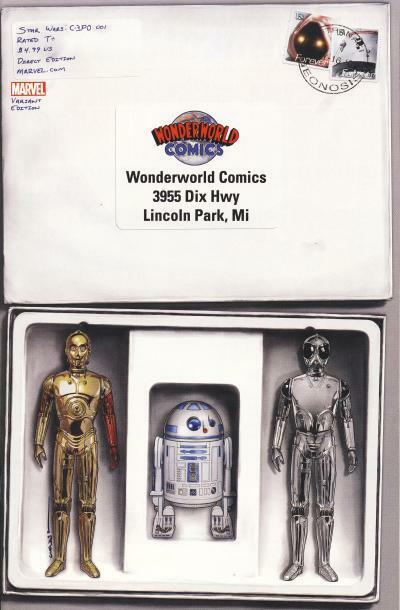 Wonderworld Comics has an exclusive for the C-3PO one-shot which shows a boxed set of C-3PO, R2-D2, and the Death Star Droid action figures. Kenner's original line included 3-pack action figure sets which are quite rare, although none included this combination of characters. 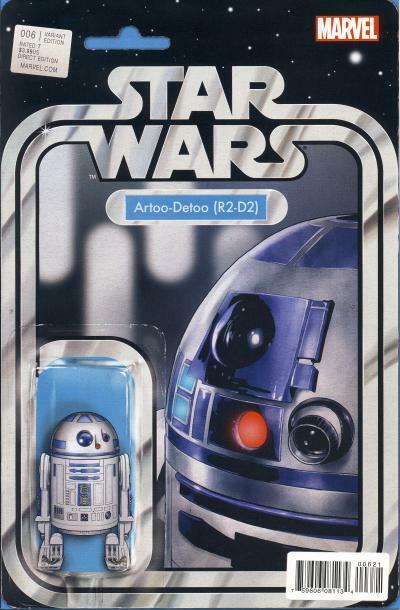 There is a vintage Droid Set that contains R5-D4, Death Star Droid, and Power Droid. Like the retailer shared exclusive, the character art is re-used art from previous action figure variant covers. Celebrating day two of the twelve days of C-3PO and R2-D2 covers! The concept art for Star Wars is just as interesting as the end result that winds up on the big screen. Lucasfilm has meticulously kept all the artwork and releases it for use on book covers, as the subject of books, and for other Star Wars merchandise. It is even referenced from time to time for material in later movies. For example, one early drawing of R2-D2 by Ralph McQuarrie shows an oval robot that moves along like a ball balancing itself using gyroscopes. This concept was used for BB-8 in The Force Awakens. It is always a treat to see the early Ralph McQuarrie concept paintings that were used by George Lucas to help convince 20th Century Fox Studios to fund the original movie. One of these paintings depicting C-3PO and R2-D2 on Tatooine is used for the cover of Classic Star Wars: A Long Time Ago #1. Dark Horse acquired the license to publish comics featuring Dylan Dog, Martin Mystery, and Nathan Never from Italian publisher Serio Bonelli Editore and published 6 incentive issues of Classic Star Wars: A Long Time Ago to help promote the line. These black and white, digest-sized books contain reprints of Marvel Star Wars issues with #1 reprinting Star Wars #91 and Star Wars Annual #1 and 3. There are actually 3 versions of this McQuarrie artwork, each with slight changes to C-3PO's torso and/or face. 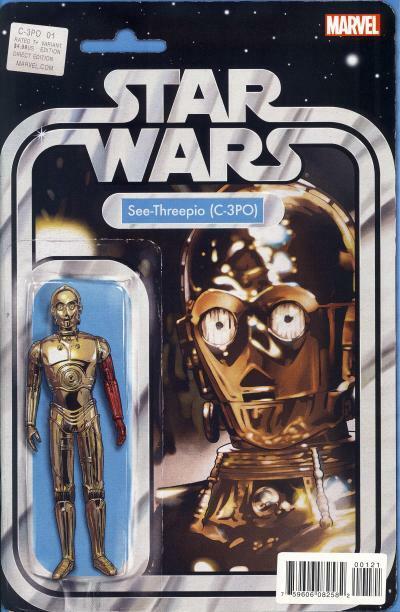 In the earliest version, C-3PO has a human-like face and torso. The expression on the face conveys sadness. A second version, which was discovered by the authors doing research for the book Star Wars Art: Ralph McQuarrie, shows a C-3PO with a more streamlined face and torso, but the eyes are very similar to the first painting and still invoke sadness. 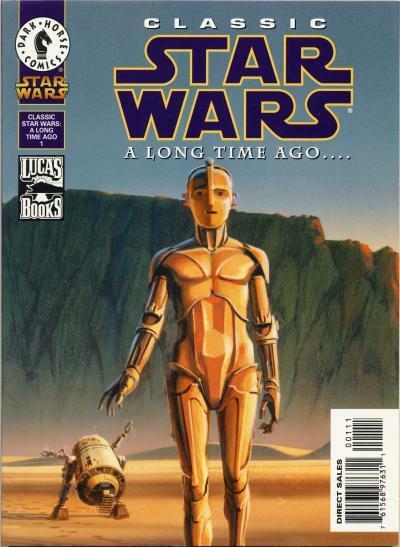 The third version of this painting, which is used for the comic cover, shows C-3PO with the same streamlined torso, but the face has been modified again to give a narrow, longer mouth and round eyes. This face is noticeably more happy than the earlier drawings. The cover is a cropped version of the original painting. Missing are two moons on the horizon and the crashed escape pod the two droids emerged from. I wonder if the idea of Tatooine's twin suns was inspired by this painting? This is the first day of the twelve days of C-3PO and R2-D2 covers! 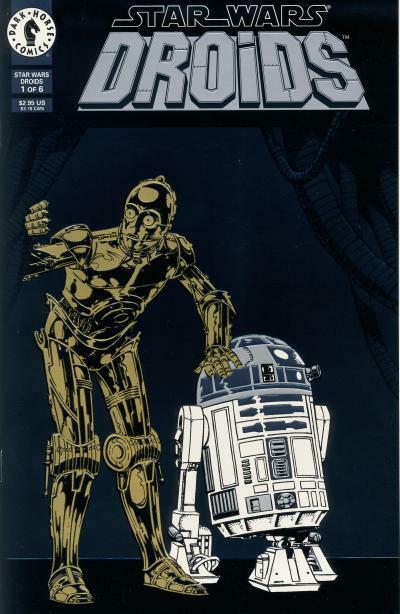 For the next twelve days, I will be showcasing comics featuring the droids C-3PO and R2-D2 on the cover. The exotic characters of Star Wars are as important to the original movie's success as the space setting and compelling story. And not least of these are C-3PO and R2-D2, the first two characters seen on film and the only characters to appear in all 8 live action movies. C-3PO and R2-D2 are robot companions to our human heroes, providing comic relief onscreen and are a vital ingredient to draw in young viewers. For kids, Darth Vader and Chewbacca are scary, but C-3PO and R2-D2 are funny and cute. R2-D2 is the precursor to Johnny 5 from Short Circuit, Wall-E, Star Wars favorites Chopper and BB-8, and many other lovable movie robots. C-3PO and R2-D2, along with Darth Vader, are immortalized with footprints in the Hollywood Walk of Fame. They have been used to host specials and were spokesmen for important service announcements like childhood immunization and anti-smoking. Many of the droids of Star Wars are cut from the same mold as C-3PO and R2-D2 injecting humor into the stories. Even the homicidal droid pair BT-1 and 0-0-0 are comic relief. In Rogue One the reprogrammed Imperial droid K-2SO provides the funniest moments of the movie. 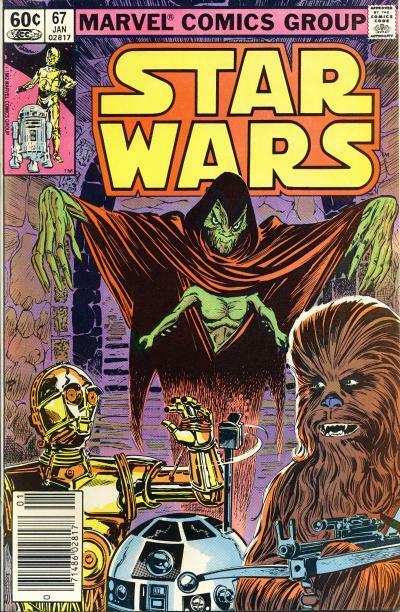 Star Wars #11, titled Star Search!, is the first part of a five-part story. Most of the issue is spent following Han Solo and Chewbacca. After beating Serji-X Arrogantus and his Cloud-Riders, the pair are captured by Crimson Jack who also holds Princess Leia captive. Leia manipulates events so that Han and Jack work together to get to the Drexel system. On the water planet Drexel, Luke Skywalker, C-3PO, and R2-D2 are on a sinking ship while they are being attacked by a creature. The issue ends when another creature shows up, this time with a rider. 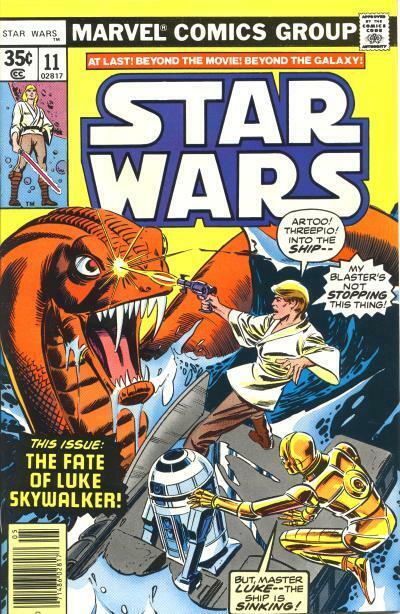 The cover art shows the desperate situation Luke and the two droids are in with the attacking creature. Interestingly, the creature on the cover looks like a cobra snake unlike the depiction inside which has a longer, dragon-like snout. True to character, C-3PO is stating the obvious while Luke tries to fight off the attack. C-3PO and R2-D2 would appear on the next three covers as well as many more Marvel covers. Why there was a dearth of appearance prior to issue #11 would be speculation. Issue #11 is the first issue drawn by Carmine Infantino who lent a distinct style to the look of the characters including C-3PO and R2-D2. 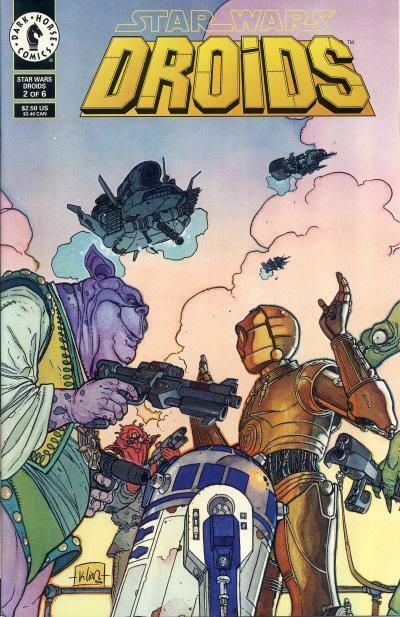 While the cover for Star Wars #11 is not drawn by Infantino, the drawings of the two droids looks like they were influenced by him. 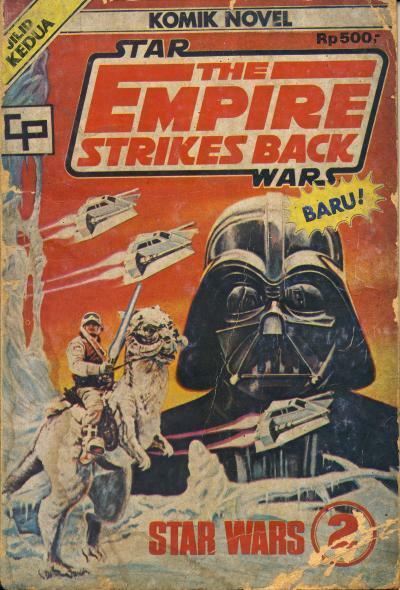 I have been fortunate enough to find the second volume of The Empire Strikes Back published in Indonesia. Like volume one, it is digest-sized and black and white. The Yoda depiction is the early version published in the Marvel Illustrated Version of The Empire Strikes Back paperback. Since the earlier posting, Retro Foreign: Indonesian Star Wars: The Empire Strikes Back #1, I have been able to compare these 2 Indonesia volumes to the paperback and the arrangement is identical, meaning the art from these Indonesian digests are taken from the paperback. The cover art used for the second volume is the same found on the U.S. paperback. This comic is labeled Jilid Kendua or Second Volume. This book is divided into 3 chapters numbered 4 through 6. Only chapter 5, Pengkhianatan Di Bespin or Betrayal at Bespin, uses the same name as the U.S. version. Chapter 4 is named Pemimpin Bangsa Jedi or The Leader of the Jedi and chapter 6 is named Pertarungan Yang Menentukan or The Decisive Battle. Today marks the beginning of the 3rd year for this blog. In the past 2 years we've seen the Star Wars comic license revert to Marvel and Star Wars comics dominate sales for much of early 2015. The Force Awakens was released to theaters in December 2015, bringing a C-3PO one-shot, a movie adaptation, and an ongoing Poe Dameron comic in 2016. Recently, Marvel ended one of their flagship Star Wars titles, Darth Vader, to make way for Doctor Aphra, a comic based on a Marvel original character. Rebels is half way through its 3rd season and the start of the season saw the promotion of Grand Admiral Thrawn from the Expanded Universe to current continuity. Rogue One opened just a week ago at the top of the box office. It will no doubt prove a success for Disney opening up the possibilities for more Star Wars anthology stories beyond those already announced. Star Wars is turning 40 years old in May! With so much going on in that galaxy far, far away, 2017 is shaping up to be another banner year for Star Wars including the comics. Darth Maul is set to star in his first Marvel mini-series and Yoda is taking center stage in the main Star Wars title. Additionally Marvel has announce it will publish 48 variant covers to celebrate the 40th anniversary of the original Star Wars film. It shouldn't surprise anyone if Marvel publishes an adaptation of Rogue One during the year and I wouldn't rule out characters from the Rebels television series getting a mini-series led by the enigmatic Thrawn. With the sequel to The Force Awakens scheduled for release on December 15, 2017, Marvel probably has another prequel title like Shattered Empire in the works as well. Regardless if any of this comes to pass or not, one thing is clear, there are new Star Wars titles coming as Marvel expands beyond the original trilogy characters. There is so many more Star Wars comics that need to be featured in this blog, both the old and new, domestic and foreign. I want to thank the readers who compel me to write about the four color exploits of our favorite movie characters. Knowing there is an audience keeps me motivated and there is no end to the comics I want to share. Thank you for reading for the past 2 years and I hope you continue to come back to read more. Marvel is going to celebrate the 40th anniversary of Star Wars by releasing 48 variant covers that focus on the original Star Wars movie throughout 2017. I know I have a hard time getting excited about this since Marvel has released more than its fair share of variant covers for the Star Wars line. Now if these were the only Star Wars variant covers in 2017, I can see the big deal. You can read more about this over at the official Star Wars website in the article Exclusive: Get a First Look at Marvel's Star Wars 40th Anniversary Variant Covers. In celebration of Star Wars Day on May 4th, 2016 and to help promote their recent Star Wars trade paperbacks, Marvel released 10 comics under the True Believers brand for only $1. 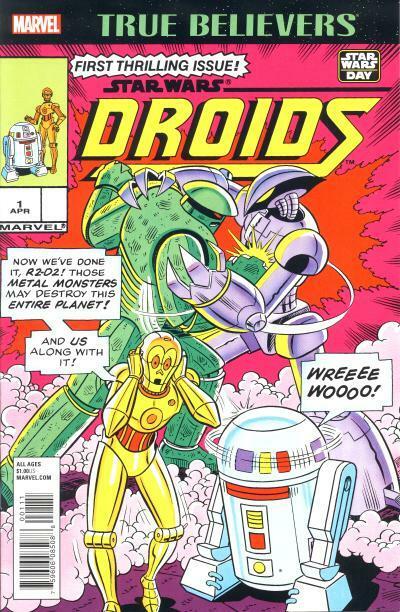 One of those comics is a reprint of Droids #1 originally published 30 years ago in 1986. The cover art used is the same as the original comic although it is cropped along the bottom to make room for the True Believers banner at the top. Star Wars #57 is the second of a two-part story about Lando Calrissian's return to Cloud City. In the previous issue, Lando and Imperial Captain Treece agree to work together to subdue a damaged Lobot intent on killing them. Lando repairs Lobot who in turn disarms bombs set by Ugnaughts to blow up Cloud City. At the end of the issue, Captain Treece throws Lando off Cloud City. At the beginning of Star Wars #57, Lobot uses a jet pack to save Lando, but their combined weight takes them to the surface of Bespin where they crash into a swamp near an Ugnaught news crew. The crew is there to film the destruction of Cloud City. An Imperial Skimmer shows up and Lando helps the Ugnaughts destroy the craft. Meanwhile, back on Cloud City, Luke Skywalker, Shira Brie, and R2-D2 show up to check on Lando and come under attack by Captain Treece. Back on Bespin, Lando and Lobot are taken to the the Ugnaught's leader King Ozz who explains that the Imperials had turned Cloud City into a slave labor camp. The Ugnaughts return Lando and Lobot to Cloud City where Imperial reinforcements have Luke and Shira pinned down. Lobot is shot and Luke uses the force to detonate the bomb primers, making everyone believe he has set off the actual bombs and Cloud City begins to sink. The Imperials abandon Cloud City and Luke let's Lando in on what is actually happening. In the end, Cloud City is free from the Imperials and Luke, Lando, and Shira leave. The cover for Star Wars #57 shows Luke and Shira in a battle with Imperial Stormtroopers on Cloud City. The Ugnaught news crew is filming the battle from one of the nearby buildings. A crouching Luke hits an Imperial Stormtrooper in the side and pieces of the Stormtrooper's armor shatters from the shot. 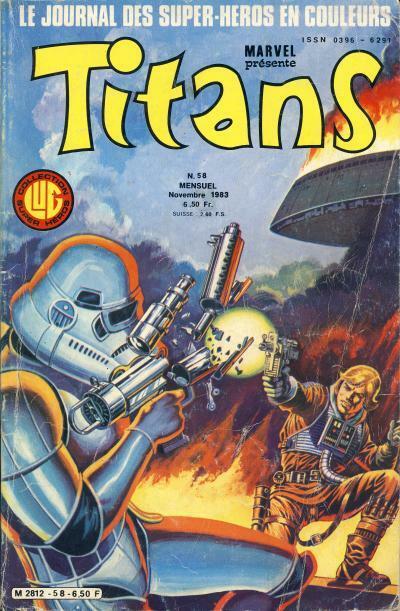 The cover for Titan #58 is another depiction of the same scene, this time focusing on Luke Skywalker and the Stormtrooper. Instead of hitting the Stormtrooper in the side, Luke's shot hits the Stormtrooper's blaster, destroying it. In the background, Cloud City is shown burning. It is clear there is something wrong with the Stormtrooper's helmet on the cover for Titans #58. There is a single eye visor instead of two, making the Stormtrooper look like a cyclops. The problem is the cover artist for Titans #58 used the Stormtrooper on Star Wars #57 as a guide, but that Stormtrooper doesn't show the complete mouth area since much of the lower helmet is hidden by the blaster. On Star Wars #57, the impression is the head is turned more and we are seeing the side of the Stormtrooper's helmet. Unfortunately, this is not the case for the cover of Titans #58. The idea that the Imperials will not return to Cloud City or Bespin for retribution is naive. I imagine this was only a temporary victory for the Rebels and Ugnaughts. The Empire will return and, upon discovering the duplicity, make life even harder for the Ugnaughts. 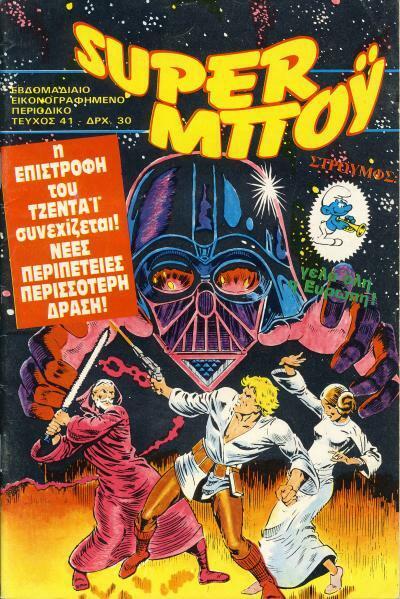 The anthology title SUPER ΜΠΟΫ from publisher Theofanis Pangalos contains the Return of the Jedi comic adaptation translated for Greek readers. 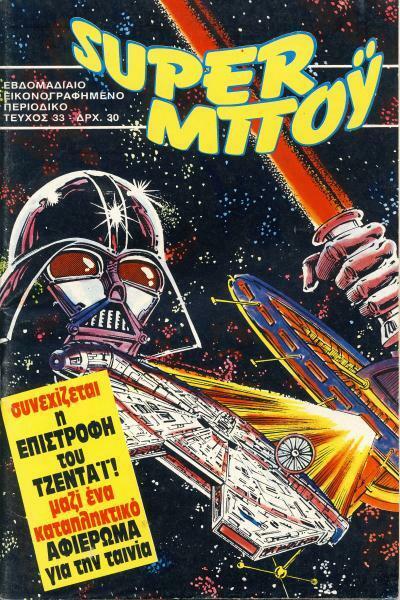 Only 3 issues of SUPER ΜΠΟΫ contain Star Wars comic covers: #29, 33, and 41. The cover art for SUPER ΜΠΟΫ #4 is from Star Wars #4. The surface our heroes are standing on has been brightened considerably with shades of yellow, orange, and red instead of shades of grey, blue, and green. Obi-Wan Kenobi's robe is brown instead of green and Luke Skywalker's hair is yellow instead of brown. In addition, Obi-Wan's lightsaber has been redrawn to be thicker. This cover has one of those strange pairings I like about foreign covers; there is an image of a Smurf sharing the cover. 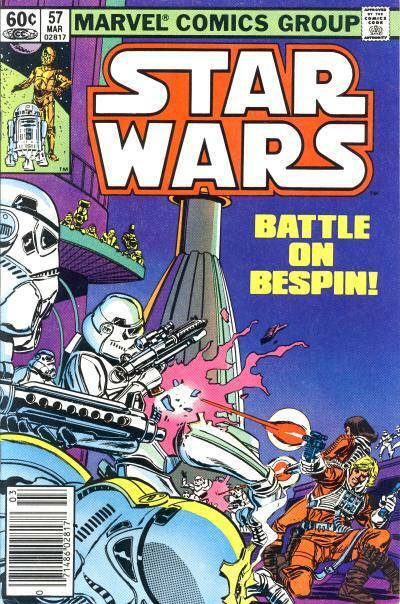 The title Comics Bruguera contains the first 15 issues of Star Wars. Editorial Bruguera also published 5 collections, with the first 2 volumes containing the Star Wars movie adaptation. The 3rd and 4th volume contain Star Wars #18 - 23 or the 6-part The Wheel Saga. Going along with this long-range concept, the producer refuses to taint the new production with the usual Hollywood sequel slang. The film, for instance, is never referred to in Lucas-Kurtz circles as Star Wars II. "I would never call it that," Kurtz winces. "Our working title is The Empire Strikes Back. And as I said, it's part of a plan that George and I had from the inception of the original film. What we wanted to do was to relate every subsequent Star Wars adventure as an episode of a continuing story, like the old movie serials used to do. We were going to call this movie Star Wars Episode Two: The Empire Strikes Back, but we ran into some problems. You see, although this story is a direct sequel to the first movie, we have three more stories that we eventually want to film that actually occur before the point where the first Star Wars begins." While it is possible Marvel knew the second movie title through their interaction with Lucasfilm, it seems unlikely they would have used it for the title of a story purposely if they had known. I have come across no source that makes me believe the story title was anything but a coincidence. 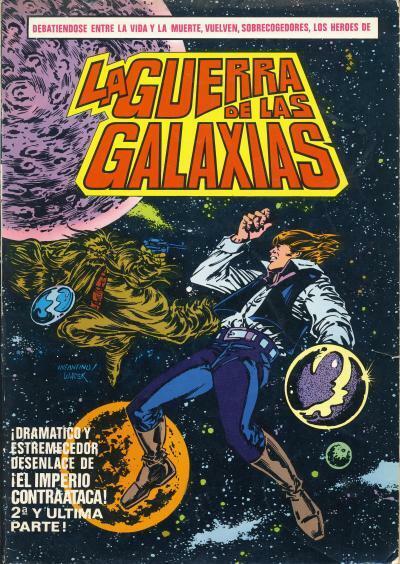 Editorial Bruguera took this coincidental title one step further however when they published la Guerra de las Galaxias #3 and 4. Instead of using the Spanish equivalent of The Empire Strikes!, ¡las Huelgas del Imperio!, as the title for the story on the covers, Editorial Bruguera used the title for the next Star Wars movie, The Empire Strikes Back or el Imperio Contraataca! Since the title for the movie sequel was known when these two collections were published, it is hard to believe this was done by accident! Was Editorial Bruguera capitalizing on the coincidence of the story title for Star Wars #18, hoping readers would pick up these two issues expecting an adaptation of the movie that was not even released yet? 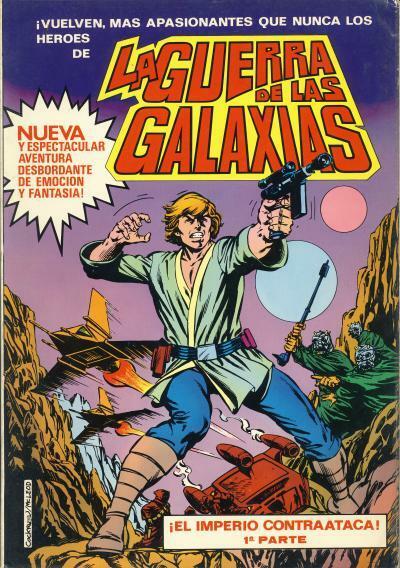 The front cover for la Guerra de las Galaxias #3 is from Star Wars #17. Because the first four volumes are larger in size, 8 1/4" x 11 3/4", than a standard comic, more art is shown on the edges than on the original cover. The top reads ¡Vuelven, Mas Apasionantes que Nunca los Heroes de la Guerra de las Galaxias or Again, More Exciting than Ever the Heroes of Star Wars! while the blurb reads Nueva y Espectacular Aventura Desbordante de Emocion y Fantasia! or New and Spectacular Adventure Overflowing with Emotion and Fantasy! The back cover is from Star Wars #23. If Editorial Bruguera was purposely deceiving Star Wars fans, the art selected for the back and front covers are excellent choices since the imagery is straight from the original movie. 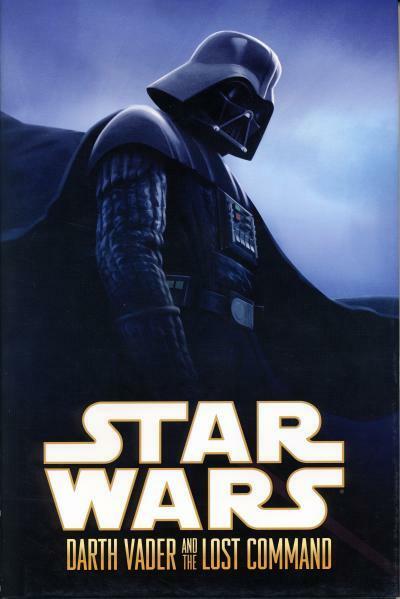 The front cover has the main hero, Luke Skywalker, along with Tusken Raiders, Jawas, and a Landspeeder, while the back cover shows the Millennium Falcon soaring through space against the visage of Darth Vader, the main villain. Notice the identification of this as the 3rd volume is on the back. 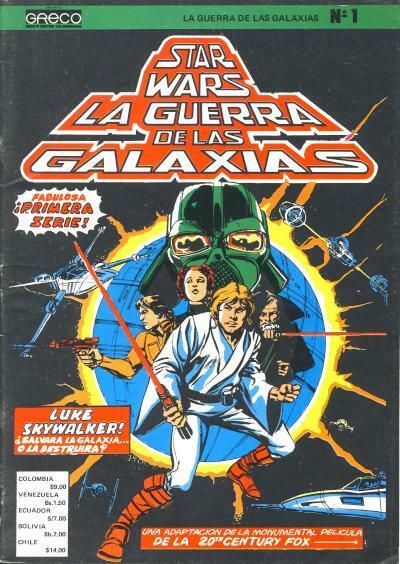 The front cover for la Guerra de las Galaxias #4 is from Star Wars #22 and the back cover is from Star Wars #25. The two extra TIE Fighters on the back cover not on the U.S. cover are just copies of the TIE Fighters located below them. Like the previous volume, the identification of this as the 4th volume is on the back. The idea for this posting came from UNIVERSO COMIC-BOOKS! – EN UNA GALAXIA MUY, MUY BRUGUERA… by Miguel G. Saavedra. The popularity of adult color books started in 2013 when Secret Garden by Johanna Basford was published. Johanna Basford's second coloring book, Enchanted Forest, was released in 2015 and both books ranked 1st and 2nd on Amazon's bestsellers list in 2015. It is reported that 12 million adult comic books were sold in 2015, up from 1 million in 2014. It is only natural that comic book publishers would join the craze. In October 2015, Marvel launched their Color Your Own line of coloring books with Age of Ultron, Civil War, Little Marvel, and Deadpool. In January 2016, DC dabbled with the idea when they released 25 alternate covers for their comic line themed as adult coloring book variants. DC followed this up with their Coloring DC line of adult coloring books later in 2016. Dark Horse announced their own adult coloring book program in June 2016, with the first coloring books set to be released in October 2016. Marvel was not idle in 2016, releasing more Color Your Own books, including Color Your Own Star Wars in October 2016. 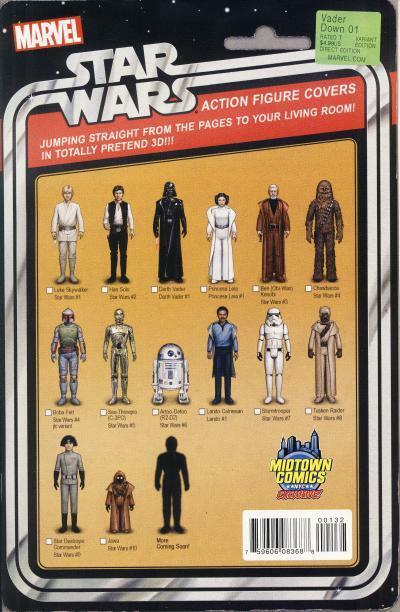 Color Your Own Star Wars is slightly larger than a modern comic measuring 7 1/4" x 11". The cover choice is clever; the artwork used is from the half-colored Premiere variant cover that was available at 2 per store. Some of the announcements for this coloring book are misleading about the content. For example, the article Marvel Announces Star Wars Comic Coloring Book on the Comic Book website says "Color Your Own Star Wars collects 120 pages of black and white artwork from the first year of Star Wars comics from Marvel." and the article Star Wars Coloring Book Announced by Marvel on the Nerdist website says "Color Your Own Star Wars will have a whopping 120 pages of artwork from Marvel’s first year of Star Wars comics that you can color yourself." Both of these article would have you believe there are 120 pages of artwork to be colored. The book does contains 120 pages, but only 59 of those pages are artwork that can be colored since one side of a leaf is blank and the copyright page consumes an entire leaf. The pages are perforated allowing them to be removed from the book easily. This is designed to allow colored pens and markers to be used in addition to colored pencils and crayons. Just don't be fooled into thinking you will have 120 pages of artwork to color! The art includes mostly covers from throughout Marvel's Star Wars comic line with a smattering of interior artwork. (The artwork is not from just the first year either, but includes artwork from 2016 as well.) Technically, these really are not comic books although the art being used comes from comic books. These coloring books would have more appeal to comic fans if they were complete comic stories, even if they reprint an entire issue in black and white. (Original art and stories would be even better, but that would be expecting too much.) It was never solicited as such, but a complete comic book that needs to be colored would be preferred over a book of pin-ups. For this reason, I would be hard pressed to spend the $9.99 retail for future Star Wars coloring books in this format. It is not unheard of for a comic to have changes from the time it is solicited to the time it is published. These differences can be as small as a slight cover modification to an entire story or creative team change. 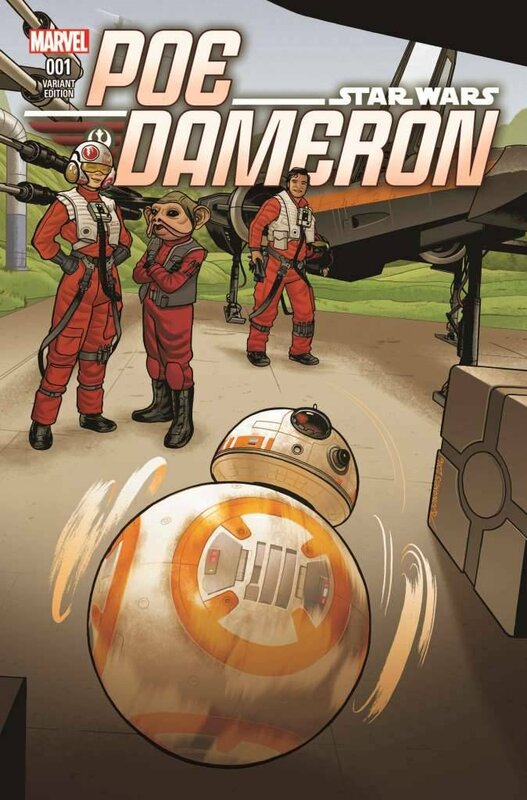 The Joe Quinones variant (aka BB-8 variant) of Poe Dameron #1 was solicited with a slightly different cover than was used in the solicitation. On the solicited cover, BB-8's head is leaning back as the droid races away from Poe Dameron and other Resistance pilots. On the published cover, BB-8's head is leaning forward. I'm not sure why the cover was changed, but the art modification does accurately reflect BB-8's head placement when he is rolling forward. In the movie, whenever we see BB-8 rolling forward, his head does come forward, which lends an air of determination on the part of the droid to get where it is going. I had some fun putting together last years 12 Days of Christmas postings. Last year's theme was Boba Fett covers. If you have an idea for this year, please let me know. As a reminder, the 12 Days of Christmas run from December 25th to January 5th. Dark Horse was nothing if not ambitious with it's Star Wars comic line. In December 1991, Dark Horse began their Star Wars publishing with Dark Empire, a ground breaking series that continued the story of the main Star Wars characters after the Battle of Endor. While Dark Empire pushed the boundaries that then defined Star Wars storytelling, Dark Horse was not content with just continuing the stories about the character's we've seen in movies. In February 1993, Dark Horse also dove into the Star Wars galaxy's past, when "for over a thousand generations, the Jedi Knights were the guardians of peace and justice in the Old Republic", with Tales of the Jedi. During the period the prequel movies were released, Dark Horse's Star Wars stories mostly centered on the Old Republic, the prequel era, or the original trilogy era. In June 2006, Dark Horse again expanded the Star Wars frontier by showing us what happened to our beloved galaxy 150 years after the original trilogy with Legacy. The Legacy comic was written by John Ostrander with art by Jan Duursema and that series ran for 51 issues plus a 6-issue mini-series. The success of Legacy led Dark Horse to use John Ostrander and Jan Duursema again to create another untold era of Star Wars stories prior to a Galactic Republic, the Dawn of the Jedi! 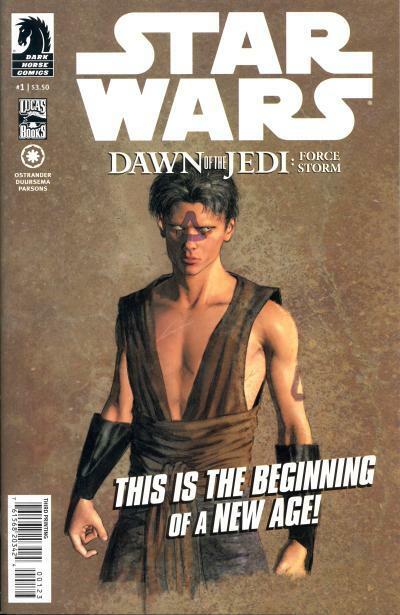 Like Legacy, the Dawn of the Jedi series is preceded by a preview issue, Dawn of the Jedi #0 in February 2012. Less a comic than prose accompanied by art from the forthcoming series, Dawn of the Jedi #0 was eagerly anticipated by Star Wars comic fans and disappeared quickly from retailer shelves. Later the same month, Star Wars: Dawn of the Jedi - Force Storm #1 was released with a standard cover and a 1:5 retailer incentive cover. The comic does a lot of world building quickly. Force sensitive sentients are brought to the planet Tython in massive pyramid-like spacecraft called Tho Yors. The story of several generations of Tython's are revealed and now their descendants inhabit planets throughout the Tython system, with the force-sensitive Tython's remaining on their home world. 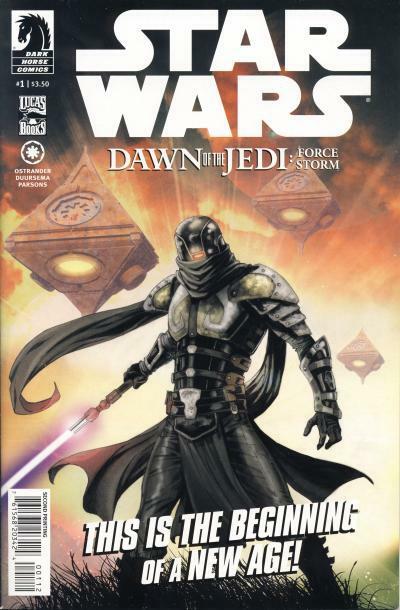 The standard cover features the antagonist for the Force Storm story arc, Xesh, a Human Force Hound for the Rakata. Additionally, the mysterious Tho Yor spacecraft are shown in the background. For the retailer incentive cover, Xesh is shown, but so are the 3 main heroes: Je'daii Journeyers Dathomirian Shae Koda, Twi'lek Tasha Ryo, and Sith Sek'nos Rath. Twi'lek Je'daii Ranger Hawk Ryo is also shown; he notifies the Je'daii Council on Tython of the approaching Rakatan ship that contains Xesh. The final character is the Cathar Je'daii Temple Master Tem Madog. 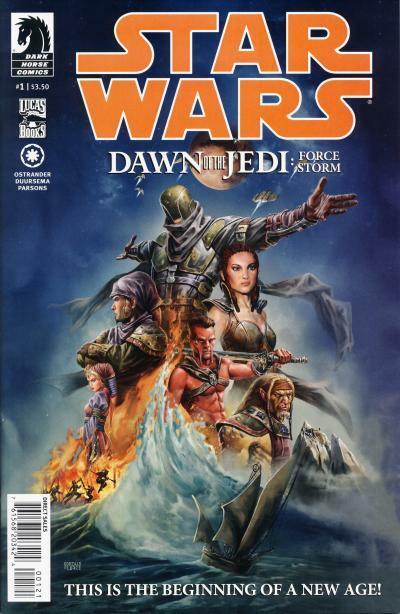 Dawn of the Jedi - Force Storm #1 was an immediate hit. It went back to print twice. The second print has the same artwork as the first print's standard cover, except Star Wars in the title is all white and the UPC box clearly states it is a second print. The third print has an all new cover by Jan Duursema that shows Xesh without his Force Hound armor. The UPC box clearly states it is a third print. Prices vary wildly on first print copies of this issue, but expect to pay more than cover price for the standard issue and $10-25 for the retailer incentive. 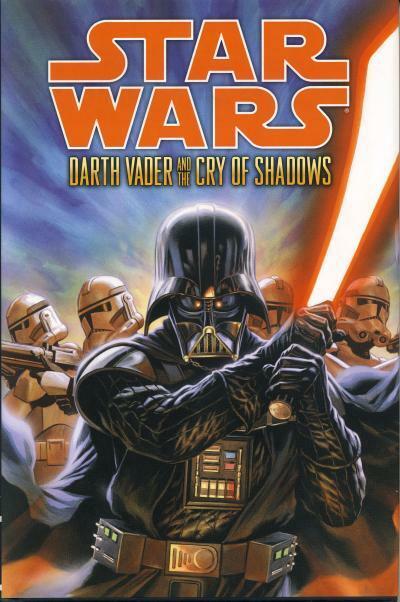 Before Marvel's Darth Vader series, Dark Horse published a series of 5-part mini-series based on Darth Vader. 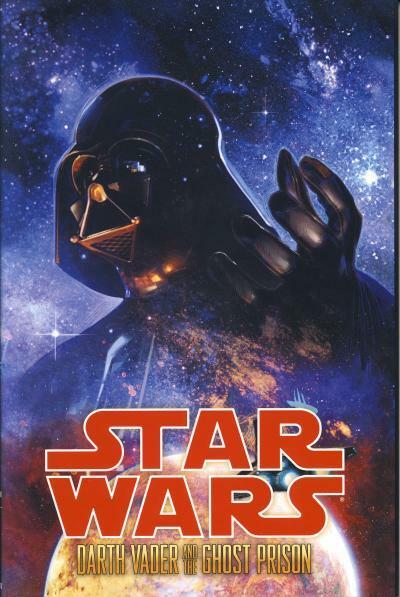 The first mini-series Darth Vader and the Lost Command was released from January 2011 to May 2011. It was followed by Darth Vader and the Ghost Prison from May 2012 to September 2012, Darth Vader and the Ninth Assassin from April 2013 to August 2013, and finally Darth Vader and the Cry of Shadows from December 2013 to April 2014. 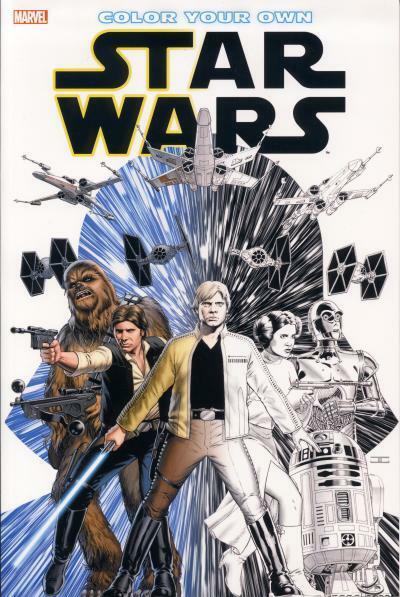 By the time this last mini-series was finished, the Star Wars comic license had been awarded to Marvel, so even if Dark Horse had plans for a fifth mini-series, it would not be completed before they lost the license. Several months after each mini-series was completed, Dark Horse published a hardcover volume collecting the 5 issues. Each volume retailed for $24.99. The cover for Darth Vader and the Lost Command hardcover is new art by Michael Kutsche not found in the original mini-series. This is the only new cover art for the 4 hardcover volumes. The cover for Darth Vader and the Ghost Prison hardcover is the same art used for the standard cover for issue #1 by Dave Wilkins. The cover for Darth Vader and the Ninth Assassin hardcover is the same art use for issue #2 by Ariel Oivetti. 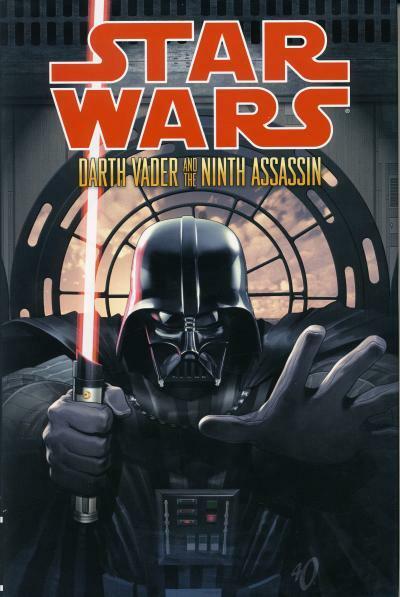 The cover for Darth Vader and the Ninth Assassin hardcover is the same art use for issue #2 by Felipe Massafera. 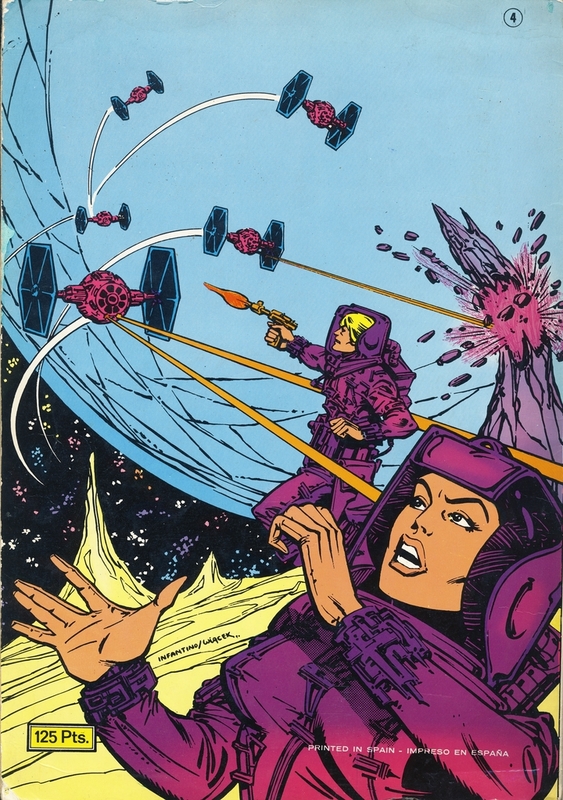 The cover art for SUPER ΜΠΟΫ #33 is from Star Wars #23. The Wheel is more brightly colored and some red has been added to the Millennium Falcon's afterburner.